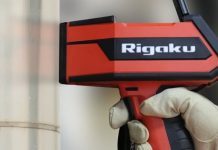 Rigaku Analytical Devices, a leading pioneer of handheld and portable spectroscopic analyzers, will demonstrate its newest handheld analyzer for metal alloy analysis at the International Manufacturing Technology Show (IMTS), taking place at McCormick Place in Chicago, Illinois. The Rigaku KT-100S laser induced breakdown spectroscopy (LIBS) handheld analyzer provides an alternative for identification of a larger number of alloys in less than two seconds, in a truly ruggedized form factor for use in the toughest environments. The KT-100S handheld LIBS metal analyzer provides on-the-spot identification of the most difficult alloys, including aluminum grades, with lower detection limits and the ability to analyze more alloys. This includes upgraded precision for low alloy steels, stainless steels, as well as high temperature alloys and the added detection of lithium (Li). In addition, the KT-100S analyzer offers unique auto surface preparation with its Drill-Down feature and is considerably smaller and lighter than other handheld LIBS analyzer currently available. Another major benefit to the user is that because the KT Series of handheld LIBS analyzers utilizes a laser excitation source, there is minimal to no regulatory licensing requirements. The KT-100S handheld LIBS anlayzer is designed to be the ideal analytical tool for use in fabrication shops, plant environments and scrap metal yards because of its MIL-STD 810G drop-test certification and IP-54 dust protection rating. For a product demonstration or to find out more about the capabilities of the Rigaku KT-100S LIBS analyzer, please visit the Rigaku Analytical Devices team in booth #135924, level 3 at IMTS from September 9-15 or visit: Website.